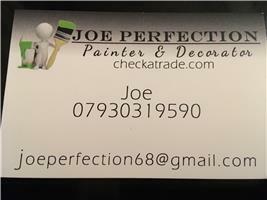 Joe Perfection - Painter/Decorator, Plasterer based in London, Greater London. Welcome to Joe Perfection and thank you for taking time out to look at our page. I take on every job in a professional manner with high standards, with an attitude that no job is too large, or too small call us. We also offer free estimates to all domestic and commercial work. If you require a fast response call me on 07930319590, alternatively you can email me on [email protected]. I look forward to hearing from you!